Almond sales are booming because of their well-advertised health benefits, but could drought in California lead to a world shortage of the nut? It has been likened to a modern-day gold rush. The growth in the popularity of nuts as a healthy snack has seen a boom in business for California's almond farmers. Eighty-two per cent of the world's almonds come from America's Golden State, where it is the leading agricultural export. "Nut crops and almonds particularly have risen in value as the world has realised the nutritional value of eating almonds and how good they are for our bodies," explains David Phippen, a life-long almond grower in the prime agricultural area of central California. Phippen's solar-powered farm is a partnership between five families. It is one of the first in the world to use robots, designed using Nasa technology, to sort good almonds from bad. It is a highly mechanised process with sophisticated irrigation systems in the orchards but, above all, almond production is dependent on the climate. The region - which is about a 90-minute drive from Silicon Valley - is one of the few places in the world where almond trees will grow. It has the perfect combination of a cold - but not too cold - winter, which allows the trees to lie dormant, followed by a mild spring that encourages them to wake up and bloom. Crucially, the trees need about 500-700 hours of dormancy followed by a frost-free period when they burst into life - usually around Valentine's Day. Farmers like Phippen have responded to the global surge in business - especially from the UK and emerging markets like China and India - by expanding their orchards. "The value of each kernel has gone up dramatically and growers are looking for the best return on their investment so they're still planting almond trees at an alarming rate," he says. "If you decided to plant an orchard right now, you would wait two years for available root stock to actually plant." The almond has not always enjoyed a positive image. "In the early- to mid-90s, nuts in general and almonds in particular were felt to be unhealthy because they had so much fat," says John Talbot, vice-president of global market development for the Almond Board of California. But he says research has shown that the fat content of almonds is a positive attribute. "It's the good fat, it's not the bad fat," he says, adding that a greater understanding of the positive role of monounsaturated fats has changed people's perceptions. Good fats, such as monounsaturated fat, have been shown to have a beneficial effect on the body, decreasing the risk of heart disease and improving blood cholesterol. Harmful fats include saturated fats which come mainly from animal sources of food. They can be found in processed foods and have been linked to raised cholesterol levels and cardiovascular disease. What is in a portion of almonds? In recent years the almond industry has seized on the health-promoting qualities of the nut. Marketing campaigns have resulted in a steady but significant growth in business. A print and online advertising campaign in the UK in 2012 positioned almonds as the "on-the-go essential snack". A Young at Heart campaign in China focused on the idea of "perpetually feeling good", while mothers in India were fed the message that almonds would help their children succeed in whatever they do. In the US, with slogans like The Crunch That Keeps You In The Game, the Almond Board of California has promoted the "crunch power" of the nut to physically active consumers. Independent research appears to support the broad claim that almonds are a healthy food choice. Researcher and registered dietician Dr Michelle Wien has been studying the health benefits of almonds for over a decade. In one study, at the City of Hope National Medical Centre in Duarte, California, Wien discovered that when the nuts were incorporated into a weight-loss programme, dieters lost a greater percentage of their bodyweight than those who did not eat almonds. "They have a good amount of fibre, they are the highest protein-containing tree nut and my patients reported that they enjoyed the crunch and the chewing of the mastication process when they were consuming the almonds," explains Wien. 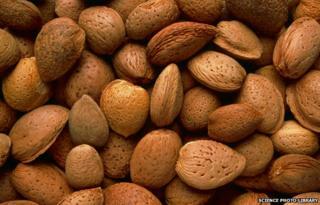 She says almonds have the effect of making people satisfied and less hungry for longer. It is a finding that has been observed by other researchers. In another study, Dr Wien set out to evaluate the effects of almonds in people with pre-diabetes. She found that after 16 weeks, individuals who were consuming approximately 43-57g (1.5-2oz) of the nuts per day, had improvements in their bad cholesterol levels. Wien, who works with diabetes patients, says almonds have qualities that make them a valuable ingredient in a snack. "Since almonds are high in fat, they will reduce what's called the glycemic index of the snack," she explains. "If you pair something with a low glycemic index, which would be the almond, with the higher glycemic index food, which would be the fresh fruit or a cracker, then you're going to minimise the rise in blood sugar after the snack." Buying almonds in bulk makes sense financially. But consumers should be aware that gorging on the nuts is not to be advised. A single 28g (1oz) serving - about 23 whole almonds kernels - contains 160 calories and while each nut carries a powerful nutritional punch, they should be eaten sparingly. Research suggests that each kernel should be savoured, individually, to realise its nutritional benefits. One study concluded that an almond should be chewed 25-40 times to optimise its satiability factor. Prolonged chewing of the nut aids the release of nutrients into the body. The cost of almonds has almost doubled over the past five years. In fact, the crop is so valuable, it has attracted a new breed of thieves. Nut-nappers, as they have become known, have been making off with produce by the lorryload, leaving a hefty dent in the profits of some growers. A truck piled high with nuts can be worth well over £100,000 ($160,000) and it is a tempting target for the opportunistic thieves. There has been a spate of thefts in recent months, although it is a problem the industry has faced for a number of years. "Two truckloads of almonds that were processed and ready for shipment were actually taken from our facility by people not authorised to take them," says Phippen. "When something is worth a lot, there are unscrupulous folks that would like to have it for nothing." The industry has hit back through increased vigilance among workers on the farms. Over the past year, new checks have been put in place to ensure that freshly processed loads are not stolen from under their eyes. "We thumbprint and take pictures of the driver, we take pictures of his licence, take pictures of the truck, we document in so many more ways than we used to, so the trust factor is being challenged a little bit and to me that's a little bit sad," says Phippen. The close-knit industry, with mostly family-run farms, has also developed an online community where word spreads rapidly when nut-nappers are in the neighbourhood. The local authorities have been successful in tracking down and prosecuting many of the thieves. In a recent case a man was jailed for a year after admitting his role in the attempted theft of almost 20 tonnes of almonds. The Almond Board of California says the theft of nuts does not pose a major industry-wide problem. A more ominous threat is the growing water shortage in California. The state is suffering its worst drought since records began, over a century ago. There has been very little rain for the past three years and reservoir levels are dropping. "They're at the lowest level we've seen for this time of the year probably in my lifetime," says Phippen. "Could we survive a fourth year of drought is the question and the answer is, 'I don't know,' I haven't tried that yet and we just don't know what Mother Nature is going to provide between now and then." As for the price, there is no sign that nuts will become a cheap snacking option, any time soon. Demand is growing but supplies are limited and the drought could fuel a further short-term increase. "It's really a matter of supply and demand," says Talbot. "Compare (nuts) to other foods and they are more expensive than potato chips and more expensive than pretzels. People willing to pay a little bit more because there is a greater nutritional value - it is the perceived value of the product." Listen to Peter Bowes's report on You and Yours at 12:00 on BBC Radio 4 or catch up on iPlayer.